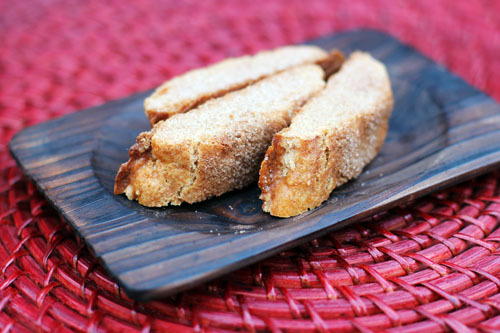 Today we have the last yummy recipe for biscotti week! Cinnamon Sugar Biscotti. I must admit, when I walked into our little biscotti class last week and saw all the various biscotti flavors at hand, the cinnamon sugar variety was the one I was least attracted to. I don’t know, I just wasn’t expecting much. Well, low expectations served me well this time around because HOLY MOLY this biscotti was good. At first bite I was stunned at how much I loved it, and then proceeded to eat not one, not two, maybe not even three of these delectable goodies. Seriously, I’m not sure how many I ate. Best not to dwell on such things. I don’t really have much to add to this recipe. It’s from Joy the Baker (again) and she got it from Epicurious. And it’s fabulous. Enjoy! Preheat oven to 325 degrees F and arrange two baking racks in the upper portion of the oven. Line two baking sheets with parchment paper (or silpat) and set aside. In a medium bowl, whisk together flour, cinnamon, baking powder and salt. Set aside. Also whisk together the cinnamon and sugar for the topping and set aside. In the bowl of a stand mixer, fit with a paddle attachment, cream the butter and sugar until light and fluffy, about 4 minutes. Scrape down the bowl and beat in the egg followed by the egg yolk. Beat in the vanilla extract. Divide the dough in two on the two baking sheets. Shape each half of dough into a 9-inch long and 1½-inch wide log. Brush with the beaten egg and sprinkle very generously with cinnamon sugar. Bake the two sheets on two different racks in the oven for 20 minutes. Rotate the cookie sheets for even baking and bake for 20-25 more minutes until golden and firm to the touch. Remove from the oven but keep the oven on. Let biscotti cool until able to handle. Using a serrated knife, cut logs into ½-inch wide diagonal slices. (Click here to see a diagram for how to cut biscotti.) Place biscotti cut side down on baking sheet and sprinkle with more cinnamon sugar. Bake again until pale golden, about 10-15 minutes. And we have a winner for the Epiphanie bag giveaway! She’s right. I gave that bag to my mom. It’s REALLY cute. Congratulations, Elizabeth! For the rest of you, if you want to shop for an Epiphanie bag, hop to it – some of the styles are selling out as we lead up to Christmas! 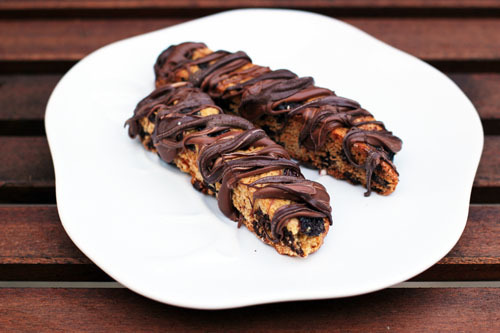 Today I have another awesome biscotti recipe for you. I think this one was my favorite. Actually, the one I’ll share tomorrow might be my favorite. No, this one. No, that one. No, this one…obviously I can’t decide. This biscotti is so good because it tastes great but it’s completely, ridiculously adorable and perfect for the holidays. Heat oven to 350°F. Combine butter and sugar in large bowl. Beat at medium speed, scraping bowl often, until creamy. Add eggs; continue beating until well mixed. Reduce speed to low. Add flour and baking powder; continue beating until well mixed. Stir in crushed candy and chocolate chips. Divide dough into fourths on lightly floured surface with lightly floured hands. Shape each into 9Ã—1½-inch logs. Place logs 3 inches apart onto lightly greased large cookie sheet. Bake for 18 to 20 minutes or until tops are cracked and ends just start to turn light brown. Remove from oven; reduce oven temperature to 325°F. Cool logs 10 minutes on cookie sheet. Jane note: this biscotti is kind of fragile, so handle with care, both at this point in the recipe and later when you dip them in chocolate. If you’re careful they will not break”¦and it’s worth it because they taste so darn good! Carefully remove logs to cutting surface. Cut into ½-inch slices with sharp serrated knife. (Click here to see a diagram showing how to cut biscotti.) Discard or eat ends (I recommend the eating option). Arrange pieces on same cookie sheet, cut-side down. Continue baking for 12 to 14 minutes, turning once, or until cookies are lightly browned and crisp on both sides. Remove to wire cooling rack; cool completely. 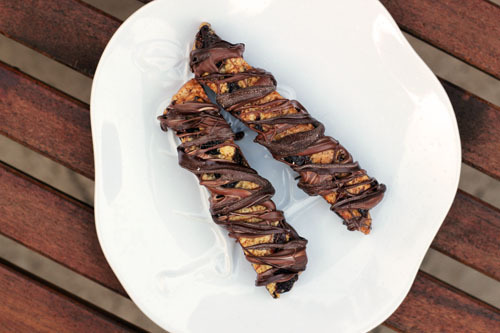 Dip each biscotti half way into melted dark chocolate; shake off excess. Or dip the bottoms in so they are dipped lengthwise – click here for a picture. I prefer this way. Place onto waxed paper. 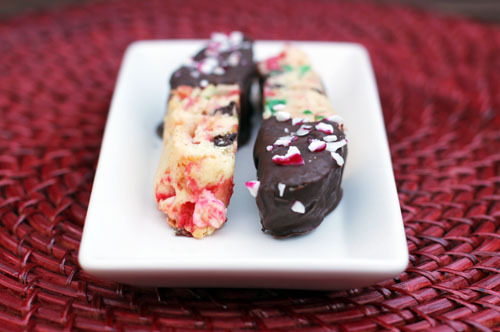 Immediately sprinkle with little candy cane pieces. Let set at room temperature until chocolate is hardened (about 1 hour). When my friend Erika was teaching us how to make biscotti last week, a lot of us couldn’t visualize how to cut the biscotti until we actually saw her do it. Someone asked that very question with yesterday’s first biscotti post, so I’m just going to do a little drawing. Hopefully this will help! Basically you form a long log. The width sort of depends on how you are going to cut it – straight or angled. Most recipes give you a guide for what size to make the log. The fun thing about biscotti is the world is your oyster! The flavor possibilities are seemingly endless, as are the sizes and way you cut them. I personally like an angled cut, so the biscotti looks a little oblong-angle-ish, if you know what I mean. Square or angled, big or small, it’s delicious any way you cut it! 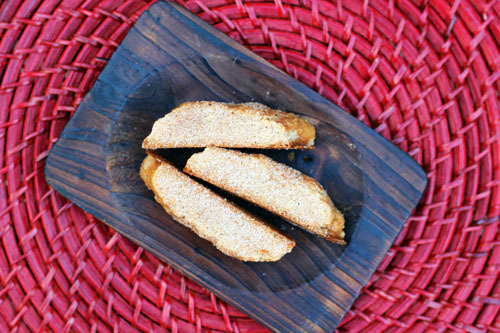 More biscotti recipes coming…stay tuned! Every December I’m on the lookout for a holiday treat to give to friends and teachers. It has to be scalable, delicious AND look cute! It’s a tall order but I believe I have found the perfect special something for this year: biscotti. I’m not some big biscotti person. I don’t ever buy it and rarely eat it. I mean, it’s good, but I just don’t think about it much. Last week I made biscotti with friends for the first time and have decided that homemade biscotti is a completely different thing. An amazing, crispy but fresh-tasting and wonderful thing. A thing that I can now add to my “can’t resist eating it” list. Because I really needed to add something else to that list. Last week my amazing friend Natalee organized a Christmas craft night. She got four of our friends to each take a station and teach us: wreath making, holiday card display wreath, Christmas glitter ornaments and biscotti. I, of course, signed up to make biscotti. If there’s food involved, I am there! My other friend Erika directed our biscotti making efforts and she did a wonderful job. It was delicious, fun and informative (did you know biscotti bakes twice? I had no idea!). It was such a great night! Since I loved all of the biscotti we had that night, I thought I would share the recipes with you this week! 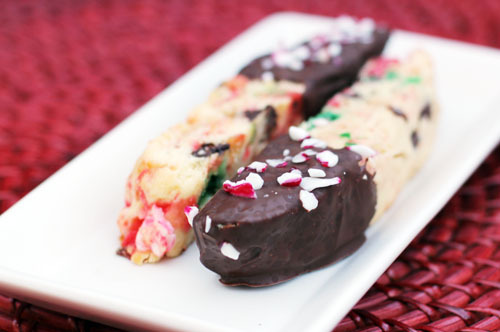 Perhaps biscotti will make it to your holiday cookie plate this year, too! 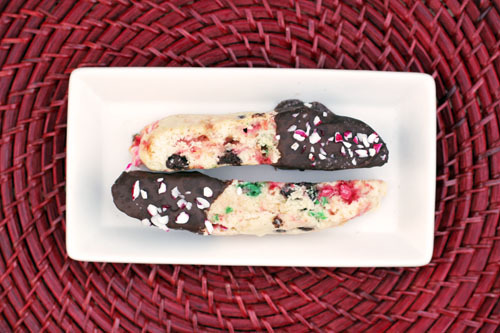 Today’s recipe is Chocolate Cherry Biscotti, which is adapted from Gourmet and Joy the Baker. It is AWESOME. That is all. Soak cherries in boiling water to cover in a small bowl until softened, about 10 minutes. Drain, then pat them dry with a paper towel. Put a rack in the middle of oven and preheat oven to 325 degrees F. Butter and flour a large baking sheet, knocking off excess flour. Whisk flour, sugar, baking soda, baking powder and salt in a large bowl. Add eggs, vanilla and honey and mix with an electric mixer at medium speed until dough forms. Add cherries and chocolate chips and mix at low speed. Turn dough out onto a well-floured surface and knead several times. Halve dough. Using floured hands, form each half into a slightly flattened 13-by-2-inch log on baking sheet, spacing logs about 3 inches apart. Brush logs with egg wash. Transfer logs to a cutting board. With a serrated knife, cut diagonally into ½-inch thick slices. 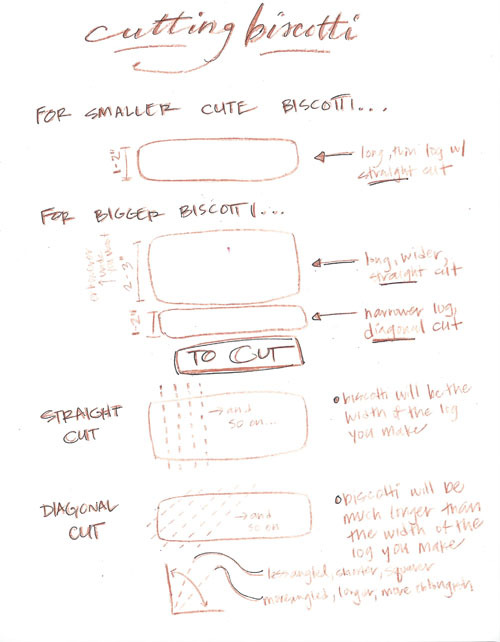 (Click here to see a diagram for how to cut biscotti.) Arrange slices, cut side down in one layer on a baking sheet (it’s fine if slices touch each other). Bake, turning once, until golden and crisp, 20-25 minutes. Transfer biscotti to racks to cool. 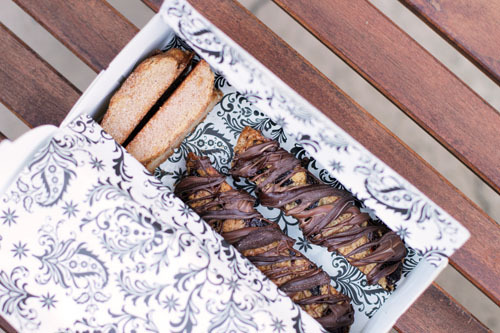 Once cool, drizzle biscotti with milk chocolate, dark chocolate or both! Let sit until chocolate sets, about an hour. Please note, Joy's recipe for honey pistachio biscotti says 1½ cups of flour, but you need to use 2½. The original Gourmet recipe calls for 2½ cups and Erika said the first time she made it with less flour and the dough didn't work. Hi, everyone! My menu is super late today. And I don’t have a photo. Because we’ve been at war. At least it feels like it. We were up all night with Owen, including a trip to the ER where we found out he has croup. So, Nate and I started the day out completely dazed, exhausted and overwhelmed…and then I found lice in one of the girl’s hair this morning. Because we didn’t have enough to worry about. Thank GOODNESS my sister is in town and it’s the weekend or I don’t know what we would have done! – Cate’s birthday party! I’m sure we’ll grab a bite somewhere when the party is over!